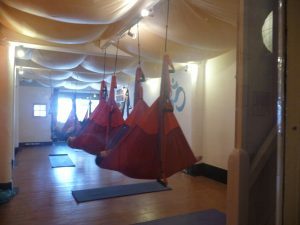 Andrew will guide you safely and easily into a yoga sequence that will be based on the use of the sling and will include inverted postures, chest opening, strength building and also a gorgeous “suspended” long relaxation. This class is suitable for those who have practiced some yoga. £12 for drop in session – Unlimited class pass holders £ 9 – 10 class pass holders £5 (plus a stamp on their card). Bookings for private groups also being taken, inquiries are welcome.